Being a successful DBA is less about reacting to a problem, and more about being proactive and keeping ahead of the headaches – so it’s vital to stop poor database performance before it affects your applications. But a DBA’s time is precious, and it seems every minute of the day is taken before he or she steps foot in the office! How can a DBA be proactive in finding and fixing database performance issues and simplify all of the day’s complex management activities? 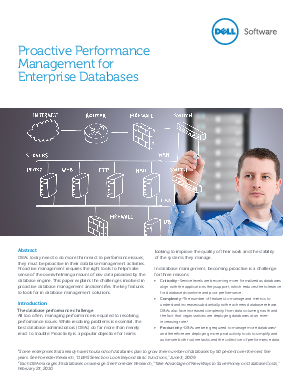 Stay a step ahead of your enterprise database challenges! Read this white paper today.